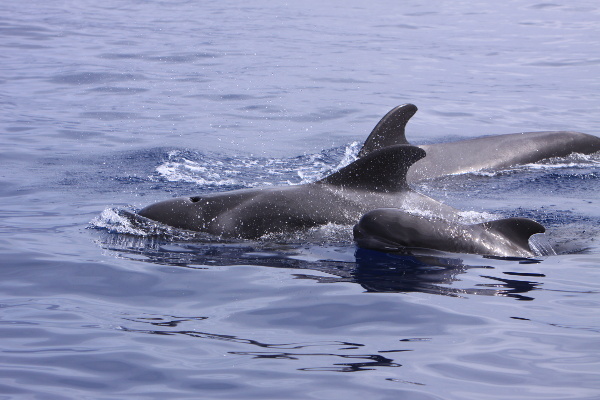 The practical course on whales and dolphins of La Gomera was made up of seven outings at sea and courses in which we analysed the collected data. Tina and Volker were our guides. They shared their enthusiasm and knowledge with us. For this brief report, I will focus on the sea outings. Our outing on October 24 was one I must dwell upon a bit: The next to the last outing of the course was a long excursion of more than six hours starting at 6:30 am. Fabian Ritter joined us on board. What a treat! He is the accoucheur, motor, soul and head of the M.E.E.R. project founded in 1997. On this early morning start we experienced the sunrise over the Teide of Tenerife. Stunning. We did not know it yet but this outing would be extraordinary, with many sightings, including some very rare ones. 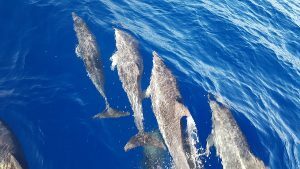 It began “slowly“ with bottlenose dolphins and pilot whales. Then, it was one sighting after another. 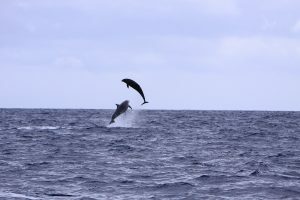 First, a new species for us, Cuvier’s beaked whale followed shortly by four other beaked whales, two females and two calves. What species exactly? A Gervais’ beaked whales, a very rare sighting off La Gomera. No time to regain our composure though. 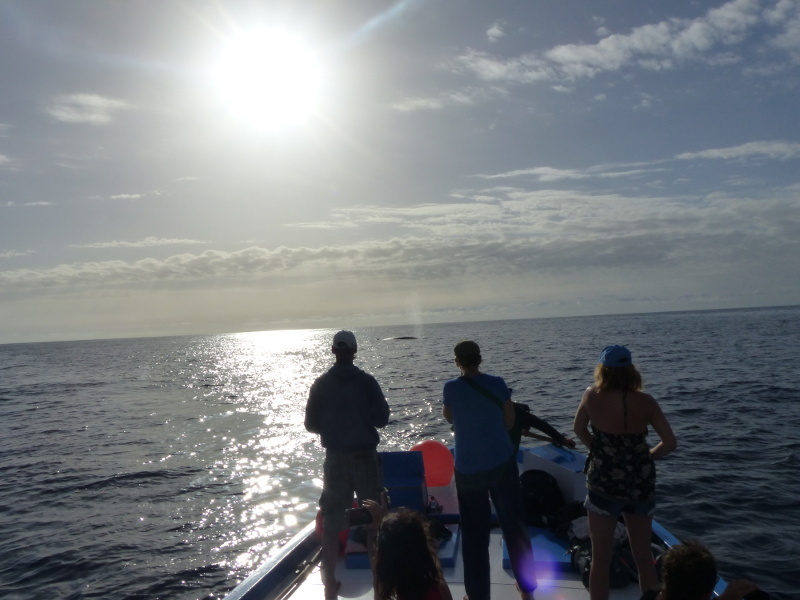 Afar we saw a large blow, a baleen whale for sure. 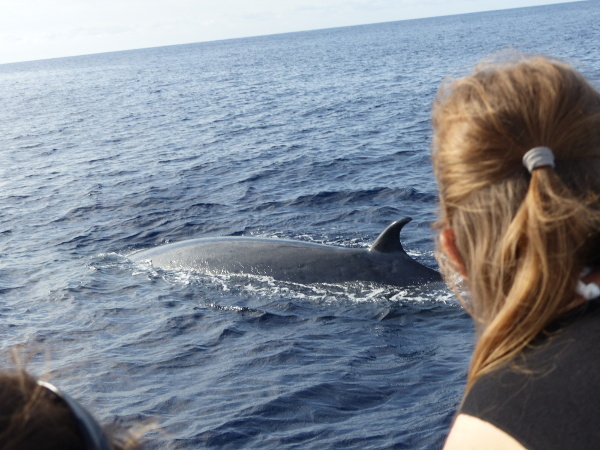 As we approached the animal, we could observe three folds on the whale’s head, it was indeed a Bryde’s whale. Back on solid ground, we analysed the results of the data collected over the two weeks. 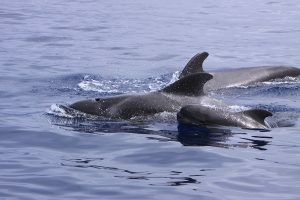 A few interesting facts clearly stand out: during every outing, pilot whales showed up, followed by bottlenose dolphins. These two species make up 75% of our sightings. 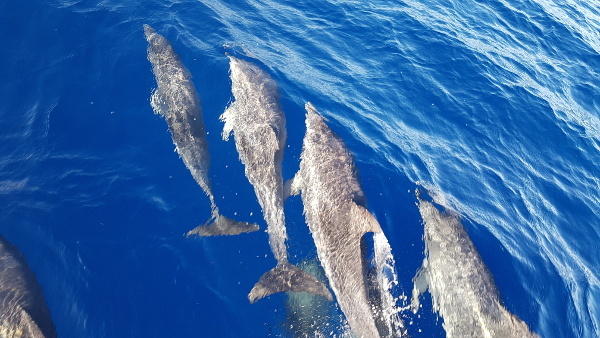 However, spotted dolphins interacted most with our boat by bow riding. 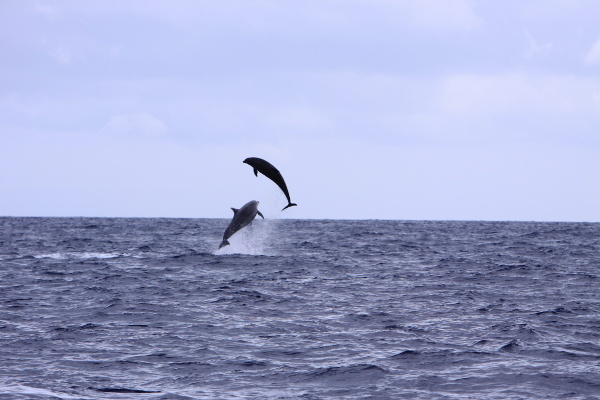 The spectacular behaviour of this species of dolphins captivated us with jumps of several meters out of the water. In the end, we observed no less than seven species: the short-finned pilot whale (Globicephala macrorhynchus), the Atlantic spotted dolphin (Stenella frontalis), the common bottlenose dolphin (Tursiops truncatus), the striped dolphin (Stenella coeruleoalba), Cuvier’s beaked whale (Ziphius cavirostris), Gervais’ beaked whale (Mesoplodon europaeus) and Bryde’s whale (Balaenoptera edeni). These magical moments will forever be engraved in our hearts. Thank you Tina, Volker, Fabian, Mai, Noé, Sarah, Stefan, Sarah, Renate, Tanja, and Peter.